The biggest complaint of almost every 3G subscriber in India is the patchy network across the country. While the situation has been improving over time, there is certainly scope for improvement. Finding a perfect 3G operator is no less than a struggle even in cities like Mumbai. In view of this situation, we initiated a unique effort to assess the quality of 3G networks in India on the move! We started by experiencing Airtel 3G across Coastal Karnataka and Hyderabad regions. Our experience was fairly good and we used the opportunity to make certain observations. Time required to connect to 3G network was minimal – the connection used to get established within seconds after turning on mobile data except in few cases when I was indoors. The EDGE – HSDPA switch was seamless most of the times. Only when network was weak the phone used to be out of signals for brief moments. No issues were faced in roaming circle, i.e., Karnataka. Peak download speed experienced was 3.33 Mbps and the lowest was 0.01 Mbps (probably due to a distant 3G BTS). As TelecomTALK readers have always noted in comments, Airtel’s 2G speeds seemed to be better when compared to BSNL’s! For instance, a twitter timeline refresh would require several retries on BSNL 2G, while on Airtel 2G it was fairly quick and no retries were necessary. 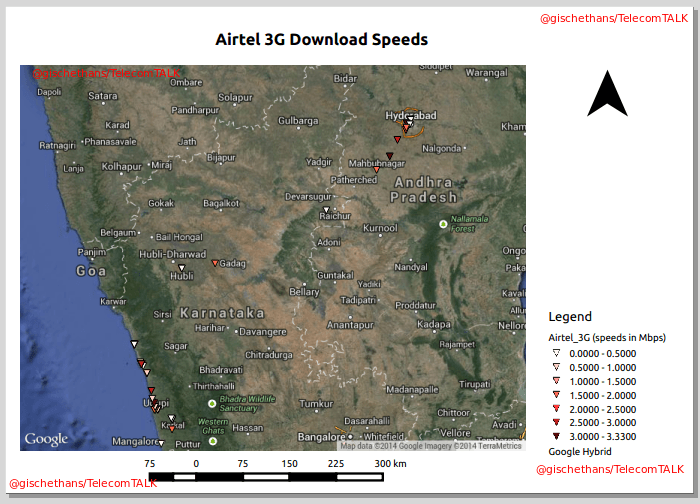 Here is a map showing locations where 3G speeds were measured. You can download the KML file for offline viewing (through the file menu on Drive Viewer) in Google Earth – online viewing on Google Maps might not show the associated attributes. At present Airtel 3G is one of the most expensive in the market. Airtel must ideally think about deploying a least-cost network to bring down expenses and hence tariffs. As noted above, different speeds were experienced in populated places at peak times. The situation will only worsen as more and more people switch to 3G. Hence Airtel or any other operator needs to commission adequate infrastructure. So readers, what do you think about this analysis? How do you think we can improve? Thanks to Airtel Delhi and Airtel AP for providing us this opportunity. We also appreciate instant responses received from @Airtel_Presence during this review. We look forward to reviewing other 3G networks in coming days!